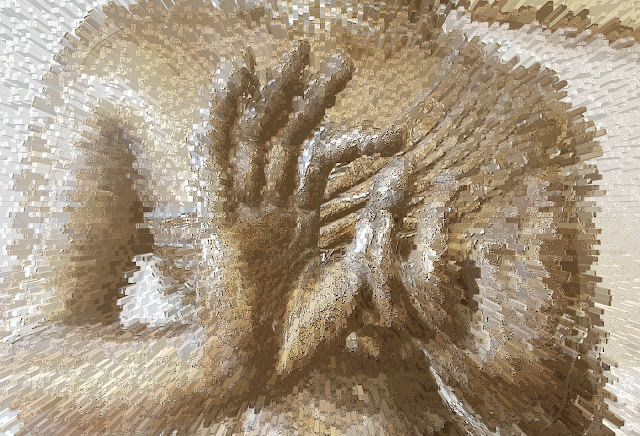 It's time for the weekly, virtual showcase for digital photo art, aka Photo Art Friday. As is the norm for every edition of PAF, you can showcase any piece of photo art that pleases you. Remember 'art' is the key word for what we try to do here. Or, if you choose, you can link up a piece of photo art that has been made following this week's theme of 'digitally-edited still life'. The themes here at PAF are always optional, so if you are unable to devote the time or energy required to participate in a challenge you can still post a piece of photo-art from your archives. A couple of sweet participants have assumed that I create the themes based on work I have already prepared and decided to showcase. Let me assure you that is not the case. I make a point to choose the theme/challenge with no photo or digitally-edited piece consciously in mind. 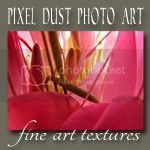 It's quite a challenge to come up with themes that challenge the more experienced among us while not intimidating those of us who have just begun to create photo art. I want to experience a weekly challenge that demands thought, effort, learning, growth and to experience the same challenge in the same way as the rest of you! That's half the fun!!! Besides, to select challenges based on what I already know I want to showcase would be way too self-serving. The above piece of photo-art was made using the photograph you see on the right. After a bit of sharpening and a levels adjustment, the pdpa Signed & Sealed texture (see below) was applied and blended in Hard Light at 85% opacity. A layer mask was used to remove bits of the typing from the cases. A final pass through RadLab added to the vintage feel. 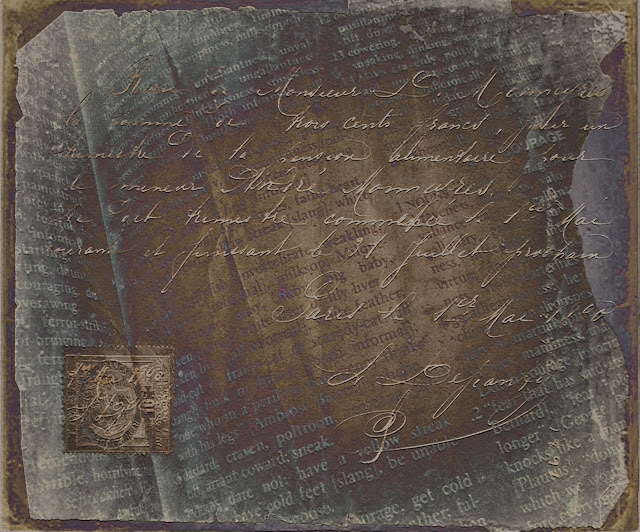 To download a free, high res version of pdpa Signed & Sealed texture, click HERE. I know you will love the variety of effects you can achieve using it. Don't be afraid of how dark it is. 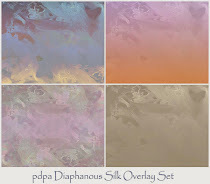 Experiment with different blending modes and you will discover a variety of great results. 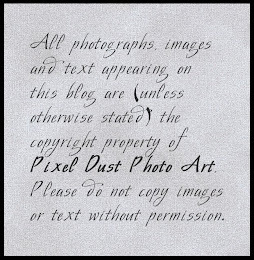 In fact, why don't we make using the pdpa "Signed & Sealed" texture as the optional challenge for next week's Photo Art Friday. Bonnie, these are both outstanding! I absolutely love the blue and bronze buddha. And I can't wait to use the new texture. oh my!! I am flummoxed and gob-smacked!! what an outstanding collection. I am thinking that this PAF will teach me a new way of seeing... already it has and I've only seen yours and 2 others' which were shared in Texture Tuesday. WOW WOW WOW and might I add, WOW!!! I love what you've done and I look forward to trying out this new texture. glorious, Bonnie!!! BRAVA!! 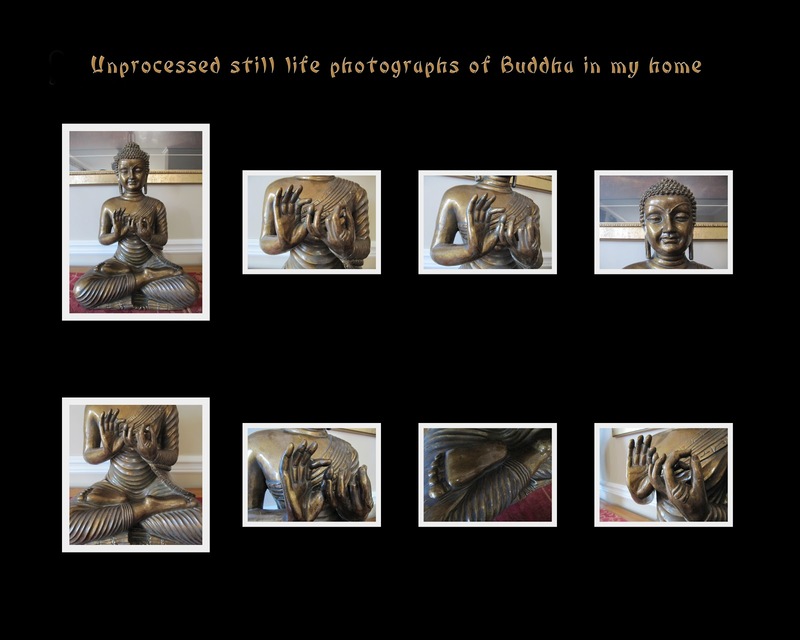 Wow, that second Buddah is very cool and love that new texture...works great with your still life!! Beautiful edits, as always! I think my favourite is the one with the vase. Looking forward to trying "signed and sealed". I also love that second one...also, the gorgeous suitcases, I have a few decorative ones, and funnily enough just bought another gorgeous little one this evening to put my craft things in :) great processing as always. I love your images, Bonnie, and am very intrigued by the "extrude" effect. I will have to play around with that! Thank you so much for the free texture - I can't wait to try it out. I love your Buddha edits, Bonnie - especially the first one! Love the Buddha and what you've done with it! The bringing out of its own texture in the first image is beautiful, and the second - incidentally - resonates so well with the sci-fi fantasy I'm reading at the moment... :) Fascinating cross between ancient and modern! Super nice texture on the Buddha photo! 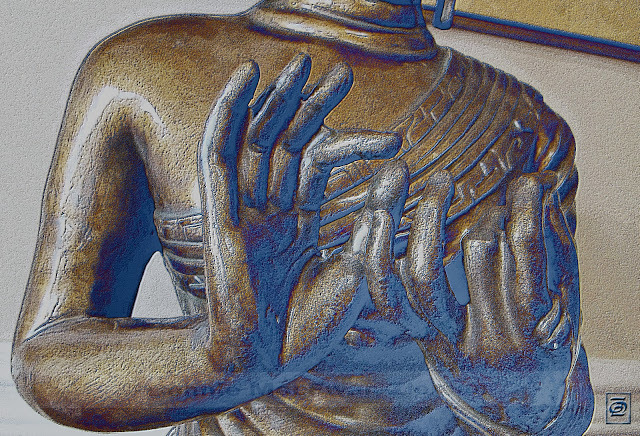 I love the gold tone with the blue accents, and the way you zoomed in on the fingers in their mudra. Really gave a different dynamism to the picture. 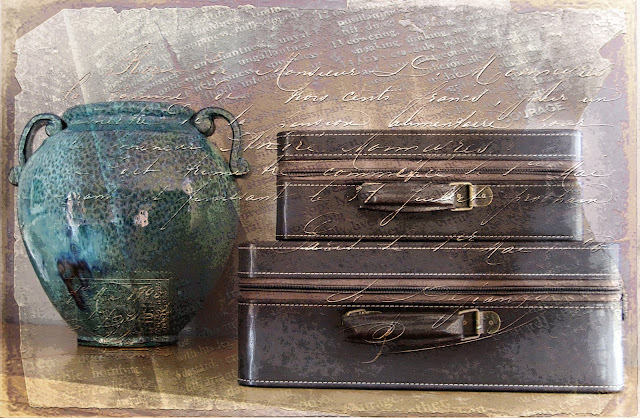 I'm also really drawn into the edited photo of the luggage with pot: the writing and tones of the overlay gives it an air of mystery, history--and romance. I always love your work, Bonnie, but I really really love the suitcases. Thanks for a wonderful prompt and I look forward to trying your new texture!! Wonderful photos ... I love how you created the texture in the suitcases. Greetings. found this one quite challenging Bonnie but as per your mantra you've kept it simple and made it brilliant. 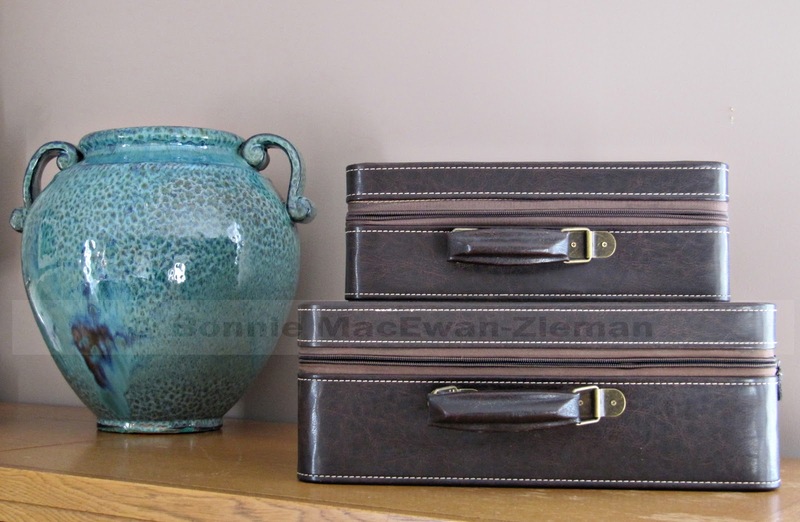 Love the suitcase still life with and without texture - can't wait to use this one next time. Thank you! I have googled the topic and read from various discussion forums, to find the definition of "still life", and I must admit that I am still not quite sure. Some places I read that it could be "dead" objects, while in other places I read that it was cut flowers, fruits, vegetables etc. Thanks for the new texture. I can't wait to experiment with it. It was a beautiful transformation on your photo. Your work is always so inspiring. Bonnie, I love your image with the jug and the cases. That texture is stunning on it. 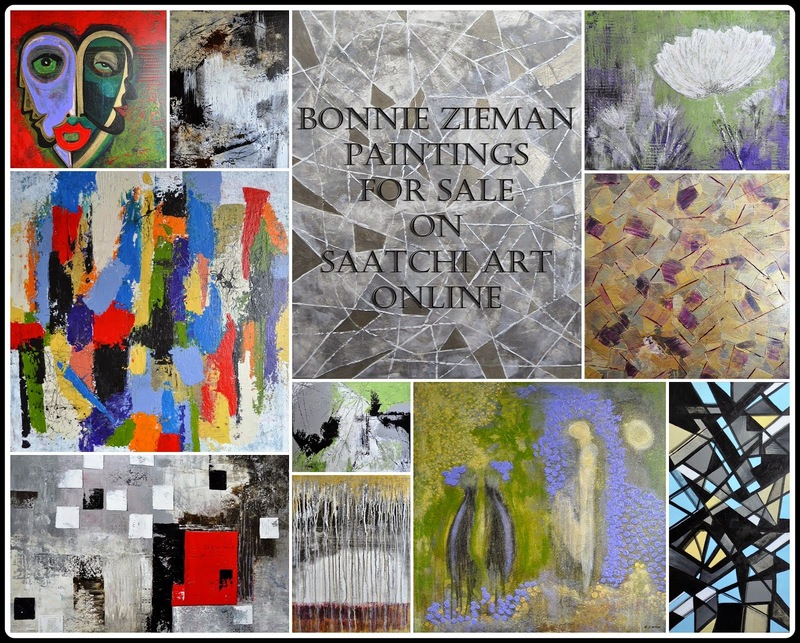 And, thank you sooo much for your generosity in sharing this fabulous texture with us. I can't wait to play with it! You still life examples are unusual and beautiful. I especially like the hands in the first sculpture - so expressive! Great challenge. I almost missed the deadline. Bonnie, i really like that last image and to think that we get to play with "signed and sealed" makes me all excited about next PAF already~! thank you for always being so generous with your textures. You really did bring a fairly simple still life composition (suitcases) to life! And i like the blue addition to the golden buddha too.